For such a time-honored city--New Orleans celebrates its Tricentennial this year, 300 years since its founding in 1718--this place is always hopping and bustling with the latest and the most innovative, whether it’s entertainment, festivals, cultural events, music, dancing, or celebrations of America's most unique culinary heritage. When it comes to cookery, our restaurant community is always in the forefront of the next big trend, whether it’s small plates and more casual dining, fresh, local ingredients, in-house creations and hand-made condiments, uncommon spices and herbs, or authentic ethnic cuisines and global flavors. 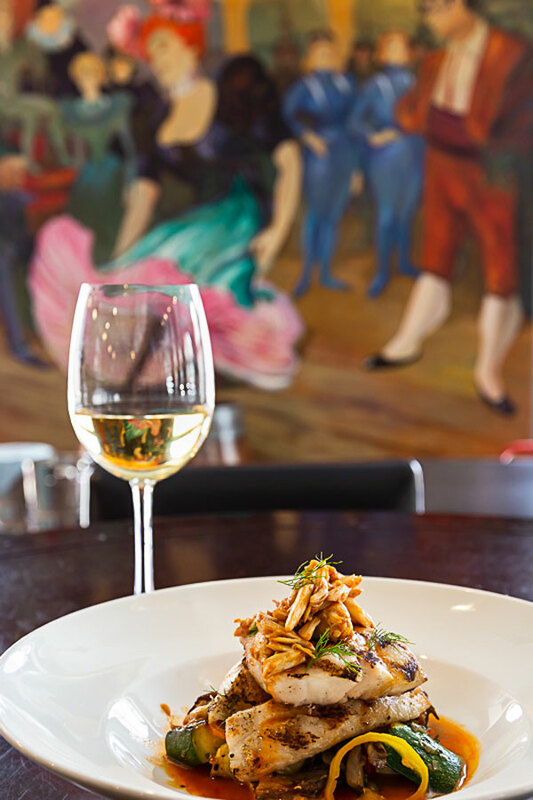 New Orleans IS and has been a trendsetter in the world of gastronomy since her founding, and continues to serve the kind of cuisine that has made us one of THE internationally renowned culinary destinations of the world. Creole and Cajun creations–inspired by the cultures that settled in southern Louisiana in the early years--are both a part of that 300-year-old history and will always be a part of our current culture as well. Both family cooks and restaurant chefs pass down some of these classic recipes through generations, and sometimes, the next contemporary makes a change or adds a new twist. Mahony’s Po-Boys and Seafood, newly opened in the French Quarter, is an offshoot of the ten-year-old original Mahony’s Po-Boy in uptown New Orleans. 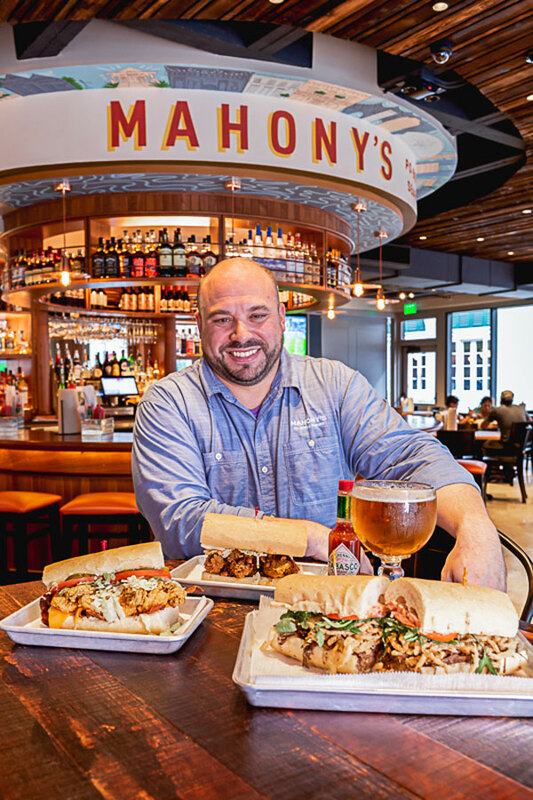 From the very beginning, Mahony’s was born from the hands of a fine dining chef-owner who parlayed those skills into his po-boy kitchen. The restaurant found its place in a community of fetish food enthusiasts, adding other classic local dishes as it grew. Over time, the ownership changed to Jim Huger, who is taking the business even further. The iconic po-boy restaurant has already established itself as a four time award winner of New Orleans’ Po-Boy Festival. Mahony’s paper-thin onion rings have also earned a place in MSN Lifestyle’s competition as one of The 10 Best Onion Rings in America. After more than 4 million viewers saw it, the dish has earned a place on the menu now, along with some of the most delectable established items, such as New Orleans Classics Crawfish Etouffee, Shrimp Dauphine, Red Beans n’popcorn rice, andouille sausage and cornbread, Low Country Shrimp and Grits, and Seafood Gumbo. The starters, salads, and the po-boys are amazingly original and delightful. There’s also Crawfish 2-way with etouffee and fried tails; Cajun 3-step with seafood gumbo, crawfish etouffee, red beans n’ rice and French bread; Redfish Almandine, and “A Taste of Mahony’s for Two” featuring the above Cajun 3 –step plus alligator sausage, debris fries, pimento cheese and spiced potato salad. Many more treats await diners at Mahony’s, like the oyster bar where fresh–shucked oysters are available with both traditional mignonette and cocktail sauces. Seafood plates feature seasonal shrimp, oysters and catfish. Another new restaurant, The Governor, has recently opened its doors and is having difficulty at closing time. That could be because the neighborhood residents, workers, visitors and passersby find the place a comfortable haven with excellent, modestly priced food in the middle of the Quarter. “I think its The Governor’s fun and friendly atmosphere and the super fresh food served that is drawing people to our doors,” said Olga Gale, a general manager for Creole Cuisine Restaurant Concepts (CCRC) organization that owns The Governor and 7 other local restaurants. “Customers come in to dine maybe three or four times a week,” she said. “Some even know the servers’ names already. We like to cater to the locals and provide that local feel and taste for out-of-town visitors as well. Our food is super fresh without any outside distributors, only local produce suppliers” Gale added. The top of the menu reads “Share the Wealth,” a Kingfish refrain, with snacks like Capital City Potatoes with pork belly trinity, Shrimp & Crabmeat Claiborne and Gulf Shrimp and Crab Cakes with Governor’s slaw. The Seafood Assembly is also worthy of your attention … with Raw Oysters on the half shell, Baked Oysters, Gulf Shrimp Cocktail Remoulade, Choupique Caviar Deviled Eggs, Louisiana Blue Crab Claws and New Iberia Seafood Salad with marinated shrimp and Gulf fish, pico de gallo and tortilla chips. House Specialties include Shrimp Clemenceau, Election Day Red Beans & Rice with buttermilk fried chicken and andouille, Fried Seafood Supper with shrimp and Gulf fish, Sugar Kettle Roasted Salmon, Pasta Nola with grilled shrimp, roasted garlic mushrooms, red gravy and linguine, and several other winners. 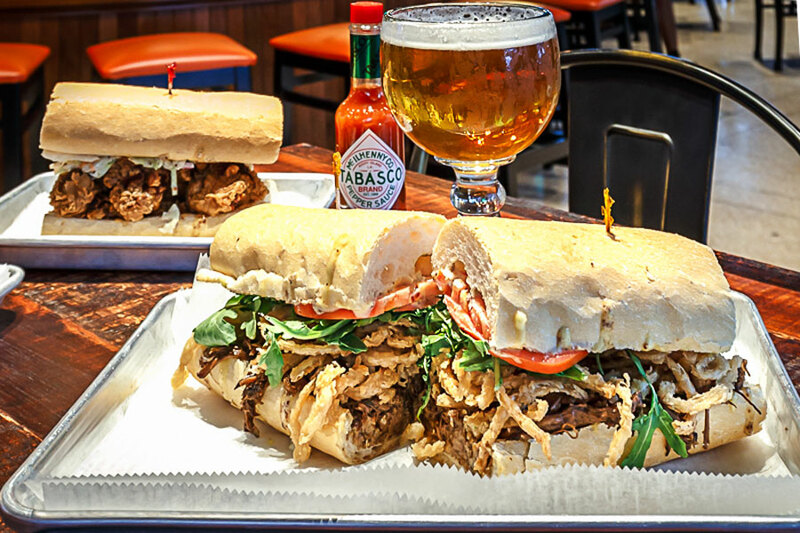 “Uncle Sammies” offer a Shrimp & Crab Cake sandwich, shrimp po-boys and The Peacemaker po-boy with fried oysters and shrimp, and a Red Stick Angus Burger, each Sammy with a side choice. There’s plenty more to love, like The Governor’s “Power Brunch” served daily, all day. Bistreaux is the Maison Dupuy Hotel’s hot dining and lounging spot on the corner of Burgundy and Toulouse streets. The restaurant’s walls, covered with copies of French Impressionist art, present a lovely setting to relax amid the pleasures of Bistreaux’s excellent food and libations. In addition to the restaurant and bar offering breakfast, lunch and dinner daily, as well as poolside and courtyard service, Bistreaux features local musicians on Friday evenings, creating the perfect atmosphere for enjoying great local cuisine, fine wine, and hand crafted cocktails. Bistreaux’s executive chef Matt Regan has shared some replacements on the menus due to the fresh, seasonal bounty of fruits, vegetables, seafood, and other ingredients influencing our dining options. ‘Naturally, we are making a few changes in our dishes,” Regan said, “to take advantage of the changing season.” To begin with, for breakfast, Regan is adding an avocado toast with heirloom tomatoes, burrata cheese and chipotle buttermilk dressing. More morning additions include a biscuit topped with a crispy crab-corn cake, tomato and Hollandaise sauce; pain perdu (French toast) with fresh peaches, Nutella and sweetened cream cheese; omelets with choices of ham, bacon, cheeses and veggies; and braised pork shoulder with cheddar grits, poached egg and Meurette sauce. “A take on grits and grillades,” said Regan. Chef Regan’s new luncheon additions are comprised of a variety of daily soups, boudin balls with sweet and hot peppers appetizer, pate of the day, a turkey bacon avocado herb mayo sandwich on multi-grain or focaccia bread, and a seasonal Gulf fish served with squash, chanterelle mushrooms, sweet peppers, citrus vin and smoked paprika tomato butter. Among the new dinner dishes added to the fall menu are a duck breast with a warm salad of peaches, okra, and fig sauce, and a tagliatelle pasta dish with house made pork sausage, artichokes, olives, celery, onions, carrots, wine and tomato sauce with fresh parmigiana cheese on top. “It’s almost like a Bolognese,” said Regan, who also offers the dish vegetarian, by request. Don’t miss it, either way! Felix’s Restaurant and Oyster Bar has been shucking fresh oysters for several generations of devoted New Orleanians’ families, and the many frequent visitors who return to the city over the past 70 years. However, Felix’s doesn’t rest on its long-term laurels. Locally owned, Felix’s has been dedicated to absolute freshness from the restaurant and bar’s beginning. “We’ve been serving oysters and our pleasure and passion has kept us constantly creating new ways to enjoy them,” said Orgeron. Orgeron and General Manager Tony Saltaformaggio are especially excited that Felix’s has regained the entrance to their restaurant on Bourbon Street after many years. Their long time Iberville entrance is still open so customers can enter either way. Another new and exhilarating development was the major renovation earlier this year of the upstairs dining room, used for private parties as well as a part of the restaurant, transforming it into a very inviting space, noted Orgeron. “The upstairs room has a full bar and a balcony over Bourbon street,” he added. Felix’s Chef Ray Culotta, and his kitchen crew have their hands full with the barrage of customers and special events to manage. Chef Culotta also develops a daily “Oyster du Jour” appetizer for interested customers. Felix’s huge menu presents oysters to order just about any way, surely to meet any oyster-lover’s choice. 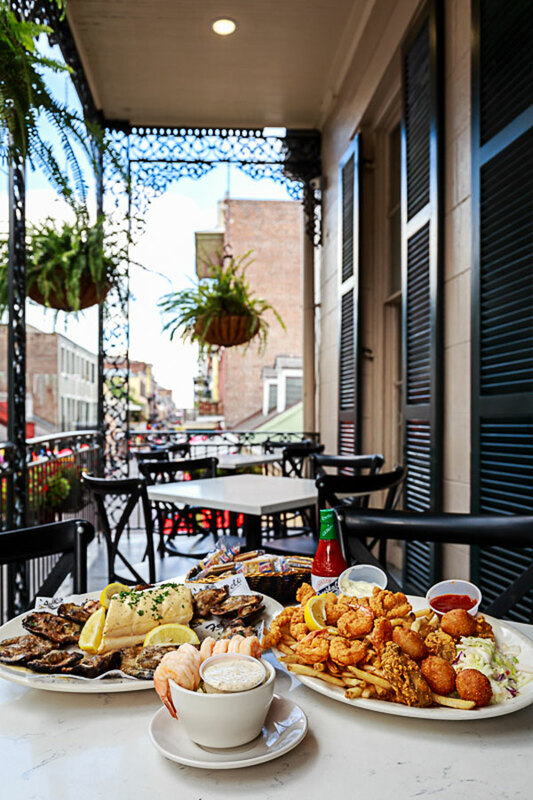 They’re on the half shell, Char-Grilled, Rockefeller, Bienville, Oysterpo-boys, Oyster & Artichoke Soup, Fried Shrimp and Oyster platter, and the mystery Oyster du Jour. Culotta didn’t stop there. Platters include fish, shrimp, and a catch of the day fish that can be fried, grilled or blackened, fried soft-shell crab, grilled or blackened chicken breast, and stuffed catfish. 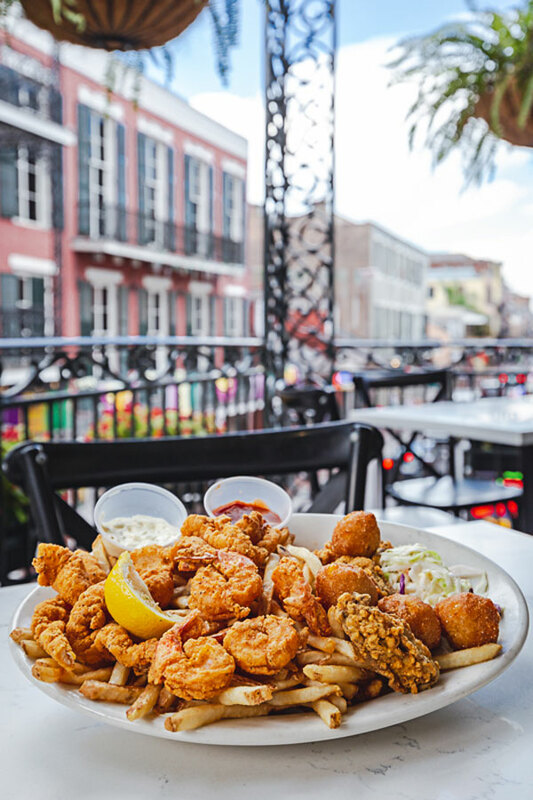 All seafood platters are served with hush puppies, French fries, and coleslaw. 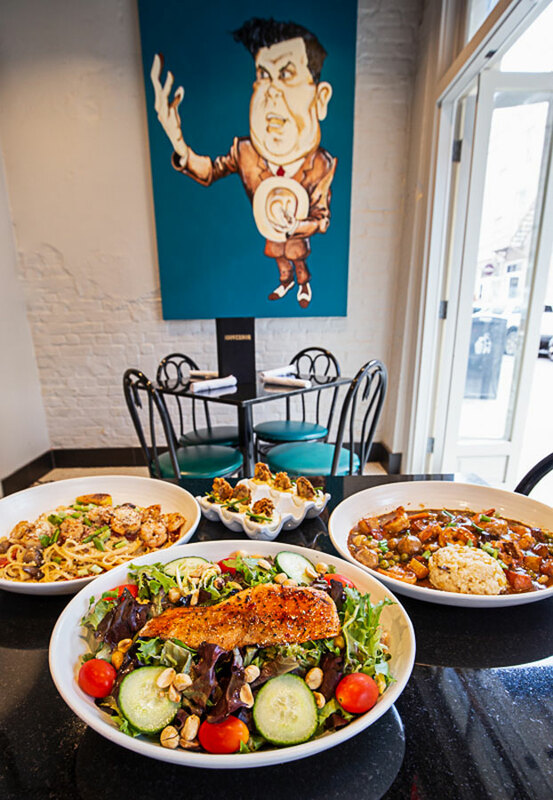 Po-boys, burgers, club sandwiches, salads, desserts, New Orleans’ classic dishes like etouffe, jambalaya, red beans and sausage, and a children’s selection round out the menu’s many choices.